Athens-based Fistbang Records have recently released Oltretomba’s The Death - Schieràti Con La Morte, the full length debut for this Italian act. As a matter of fact, Oltretomba started as a solo-outfit by Athanor’s Lucas Demon, and in 2008 he released a first (nameless) demo. In 2011, Lucas, here known as L.D., was joined by Malanoctem’s Marco Falco (on drums), and in 2012 Oltretomba came up with a second demonstrational recording, Cross The Bones. Also their friend / colleague Floriano ‘Cochise’ Piersanti came along, and as a trio, Oltretomba recorded some stuff that eventually appeared on the compilation-EP Lustful Skin. In 2013, they started working on the first full length, which this review deals with. 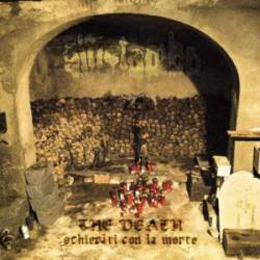 FYI: The Death - Schieràti Con La Morte was recorded and mixed at Mystical Cave and lasts for forty two minutes. The Death - Schieràti Con La Morte brings a rather refreshing kind of blackened Death Metal, with very remarkable drum patterns, great and powerful grunts, an unstoppable energy, and a very filthy, nasty sound that is just good enough not to be inferior. The mix might be too bad (the drums are too loud, the bass lines almost unrecognizable) but the performance makes everything all right. Despite the lack of originality, I cannot put my finger on one or another band specifically, or scene more generally. The band surely found its inspiration in the Old School scene, yet without sounding retro at all, and there is not a narrow-mindedness either when it comes to inspirational sources from one or another country or continent. No matter if you’re into the likes of Immolation and Incantation, or rather Tulus, Hypocrisy, Kataklysm or Goatlord; in any case you might find more than just a handful of details that will make you appreciate this stuff. The Death - Schieràti Con La Morte turns out to be a cool recording! It’s grooving, energetic and straight-ahead, with some technical highlights and melodious excellence, thrashing injections and blackened fierceness. Nice detail is the description of the line-up’s duties: L.D. on 666 necrostrings, voices from beyond, and necrophilia, Falco does graves pounding, scythe and gutsfuck, and Cochise bass disinterring, shovel and exhumation.